According to the Budget Execution Report for Q1 2017/18 (July – September 2017) by the Tanzanian Ministry of Finance, the country’s GDP in the first half of 2017 (January to June) grew by 6.8% compared to 7.7% in the corresponding period of 2016. The slowdown in GDP growth was mainly due to a decrease in lending to the private sector which affected the economic activities, the Report explains. Credit extended to the private sector increased marginally by 0.7% during the period ended June 2017 down from 17.8% recorded in the corresponding period in 2016. In addition, public expenditure on wage bill decreased by 2.5% during the same period, mainly on account of removal of dishonest workers with counterfeit secondary education certificates as well as those with other public ethics misconducts. The Report reminds that the Government has introduced various initiatives to increase the liquidity of commercial banks and thus enable them to extend loans to the private sector, including the reduction in April 2017 of Statutory Minimum Reserve Requirement (SMR) from 10% to 8%, and reduced discount rate from 16% to 12% in March 2017, further reduced to 9.0% in August 2017. 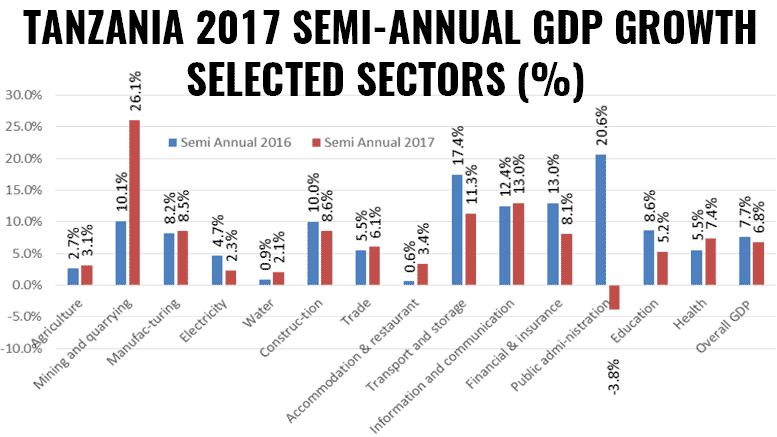 However, a number of sectors recorded strong growth in the first half of 2017 including mining and quarrying, communication, transport, and construction. In particular, the semi-annual growth of mining and quarrying in 2017 was 26.1% compared to 10.1% in the first half of 2016. Following the various initiatives that were taken by the Government, the economy is expected to grow by 7.0% in 2017, the Report indicates. The World Bank (WB) in its 16th edition of Africa’s Pulse analysis, confirmed the robust growth of the Tanzanian economy. However, its GDP growth is expected to soften, partly due to the under-execution of fiscal plans, the WB believes.